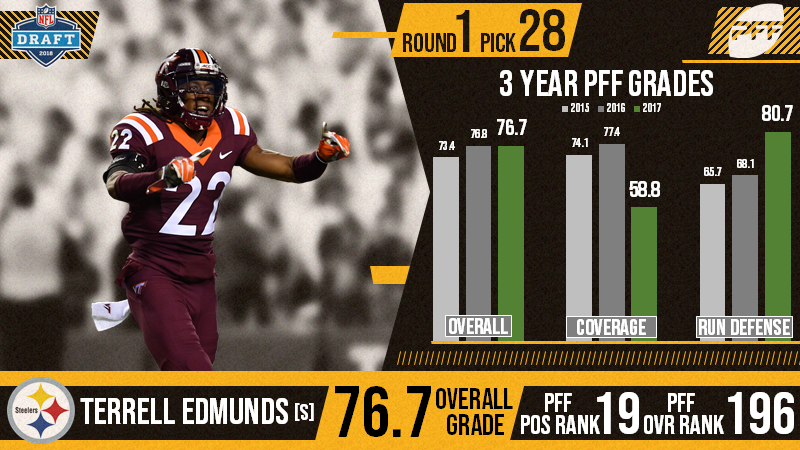 With the 28th selection of the 2018 NFL Draft, the Pittsburgh Steelers have selected Terrell Edmunds. The former Virginia Tech safety was selected 28th overall after finishing the 2017 season with an 76.7 overall grade, joining his brother Tremaine, who was drafted by the Buffalo Bills earlier in the first round. Edmunds ranked 109th among draft-eligible safeties in yards per cover snap in 2017 (1.35). He ranked 25th among draft eligible safeties in tackle efficiency in 2017 (11.4).